Citing the ecological damage caused by the frequent international flights made by academics, Jürgen Gerhards asks: do academics really need to travel so much? He then presents four simple changes that could be made to reduce the environmental impact of international academic travel. Students and lecturers alike are worried about global warming and related climate change. With a clear ecological conscience and convinced that they stand on the right side of history, they cycle to their university campus, buy a vegetarian sandwich on the way and were jointly outraged when Donald Trump pulled the US out of the Paris Climate Agreement. However, their own contribution to climate change is all too often ignored. The fact is that climate change is driven by the emission of greenhouse gases and not good intentions. 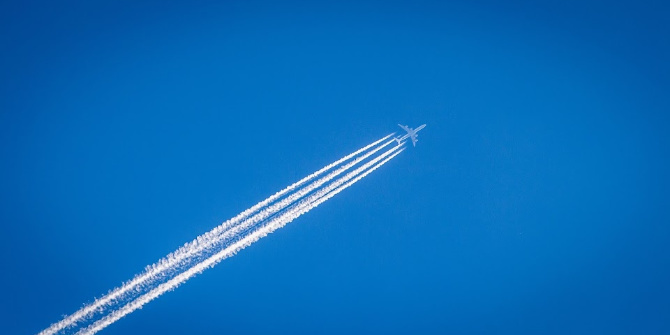 Air travel in particular contributes significantly to CO2 emissions, as a recent study by Manfred Lenzen and others have shown. Furthermore, students and academics are among the most frequent flyers, they thus significantly contribute to climate change. This is in part a response to the increasingly globalised nature of research in recent decades. The composition of research and doctoral committees has become increasingly international in nature, and collaborations are more frequently taking place between institutions from different countries. In addition, the expectation that researchers attend international conferences has grown exponentially. The extent to which many of ones’ colleagues are jetting around the globe is often noticeable from the emails one receives from them: signed off with a carefree, “Greetings from Beijing, Tokyo or Berlin”. However, the damage of international conference tourism by academic frequent flyers is considerable. A return flight from New York to Berlin in order to take part in a doctoral committee is associated with the emission of 3.1 tons of carbon dioxide, participating in a conference in Beijing leads to 7.6 tons of carbon emissions. The carbon saved from daily cycling to the university cannot compensate for this in any way. (a) Many advisory boards and academic commissions have too many members. Reducing the number of members on such committees by a third would not only give academics more time that they could meaningfully use for research and teaching, but would also reduce overall travel and thus CO2 emissions. This is especially true for international committees, where the flight distances and thus the harmful environmental impact are particularly high. (b) New technologies used for holding video-conferences, lectures, and meetings should not only be developed further, but also used more frequently by academic institutions and their members. This is especially relevant for lectures with small audiences, project discussions with international partners, but also for doctoral examinations with international reviewers. In particular, when it comes to very small groups, it is possible to organise a virtual exchange without any problems. Universities could encourage the use of these technologies by reallocating the expenses they would have spent on travelling costs, to the respective institutes as a means of rewarding them for their eco-friendly policies. (c) The environmental damage caused by air travel can be balanced out by compensatory payments. According to calculations by atmosfair.com, a return flight from New York to Berlin is equivalent to a compensation payment of $83. The money is used for activities that contribute to the reduction of carbon dioxide emission. Universities should commit themselves to pay for each booked flight the corresponding compensation payment. (d) The publication of the number of flights made by members of a university during the last two years and a comparison between different universities would automatically create pressure to reduce the number of flights in future. The example of regular reports on gender quota has shown that these kinds of measures can be very effective. These measures have the advantage that they are easily implementable and would at the same time have a relatively strong effect on reducing the emission of carbon dioxide. Jürgen Gerhards is professor of sociology at the Freie Universität Berlin and a member of the German National Academy “Leopoldina”. I agree wholeheartedly with the above, and welcome this being discussed in this forum. An additional question that should be asked is whether a meeting really warrants the in person attendance. A 1-2 hour – or even a day long – meeting does not consistently warrant the international travel/in-person attendance, and this question should really be asked before anyone commits to an international meeting. Learned societies and other organisations have a role to play here as well alongside universities. Conferences could be made more eco-friendly but also more democratic via localised satellite events and streaming of talks and panels, which would also facilitate wider participation. In addition, plastic conference bags could be replaced with recycled cotton totes, printed programmes can come at a premium, freebies should be from recycled materials etc., meals should be locally sourced and seasonal – there are lots of options via which events can be made low impact. Great topic, will not get you many friends though. I would add #5 based on my recent experience: sabbaticals. Sabbaticals at another institution are are great way of replicating many epistemic benefits of travel and add some, + cut down on flight time (one flight in a year instead of many). 3) Compensation: maybe if you are permanently employed but pretty sure that the University would place that burden on the researcher. Now imagine being an ERC on a fixed term contract: £83 is quite a lot of money. 4) Numbers and statistics: then a teaching-heavy Uni will look better than a research-intensive one. Not really fair. One option is to replace air by train travel in distances less than <600km but I can imagine that that is easier in Europe than in the USA. None of these self-imposed “we should fly less” initiatives will have any significant impact on travel let alone the environment. Academics could lobby for an end of fuel subsidies and for ticket prices to reflect environmental impact. If attending a board meeting comes with a 1500 Euro price tag for a short-haul flight + additional travel cost, video technology would be adopted without much discussion. And departments would be forced to make tough decisions: What if a travel budget would only allow for 2 people (the really good ECRs) to be sent to the conference rather than pretty much everybody who feels like going to a mega-conference in San Francisco? As long as flights are cheap, markets are expanding and nobody wants to regulate air travel’s environmental impact voluntary initiatives will have little impact. I think that this fundamentally misunderstands what the conferences do. They are not about the research but about the networks as has been noted. Staying in one’s office and chatting on skype does not build a network. Students and academics are not among the most frequent flyers. That requires leveling up to international business and government. I nonetheless support efforts to reduce our carbon footprints. This is a very interesting article with clear ideas about how to reduce unnecessary travel – net-working for one’s own career development surely should not come at the cost of everybody’s environment. Academics will claim they “must fly” will receive ‘frequent flier miles’… then, do they use them?